The arrival on Snapchat of Mondelēz brand Sour Patch Kids is further evidence of the social messaging platform’s attractiveness to major brands looking to reach the app’s younger audience. 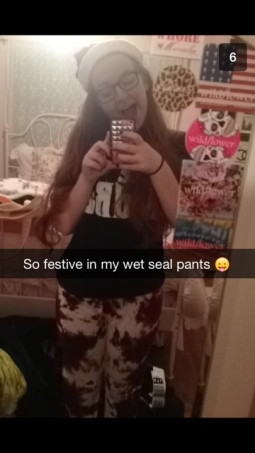 Can it measure up to the three others below, recognised as the best brands using Snapchat? As Snapchat grew and grew in popularity since launching in late 2011, inevitable talk about monetisation grew as well. But it wasn’t obvious how the app could make brands happy, since it was originally designed just for sending images and videos that would vanish once a single recipient had viewed them. However, in October last year Snapchat introduced a new feature, called Stories, that allows a conversation of more than 10 seconds that stays visible for 24 hours. This is more of a ‘broadcast’ feature of the app that has surely made brand teams take another look at Snapchat. Here’s how the Mondelēz sour jelly baby brand Sour Patch Kids is implementing its Snapchat campaign this week, plus three other brands recognised as the best brands on Snapchat. Sour Patch Kids (‘First They’re Sour, Then They’re Sweet’) centres its brand around pranks. And then hugs. 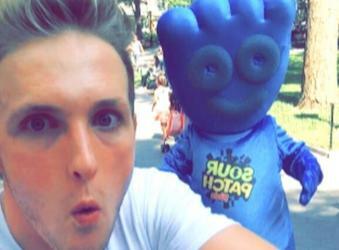 But first pranks – Sour Patch Kids has teamed up with social media comedy celebrity Logan Paul to document a week of pranks in New York City. 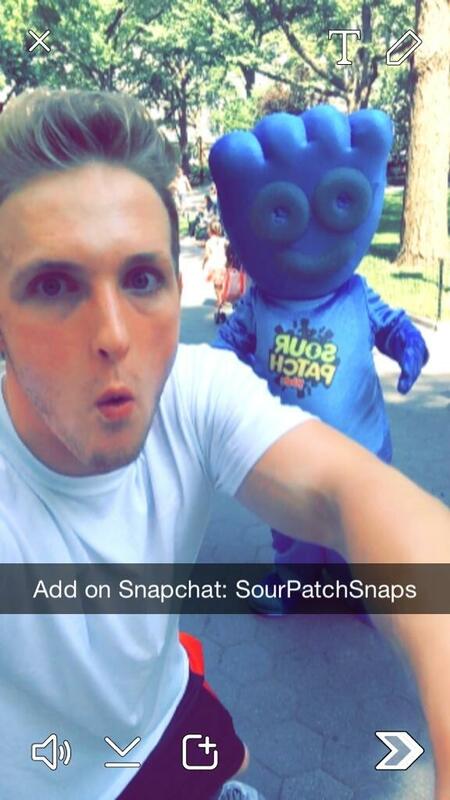 The Snapchat project will be supported across the brand’s other social channels this week, as well as Paul’s. And when Taco Bell finally made the announcement, its fans did the work for it, capturing the vanishing image and posting it across the internet for all to see. The Honda NSX (known as Acura NSX in the US) was last produced in 2005. For its return the car would do a lap on live TV at the Indy 200. 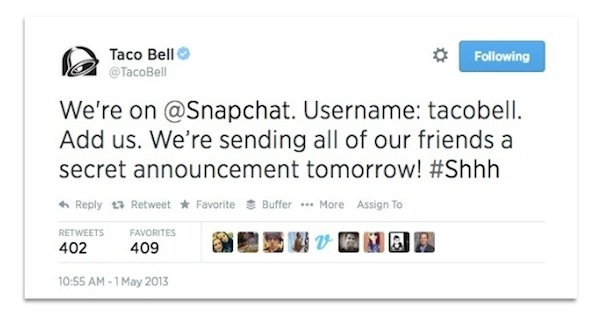 But before that, it took to an unexpected place to tease its return: Snapchat. 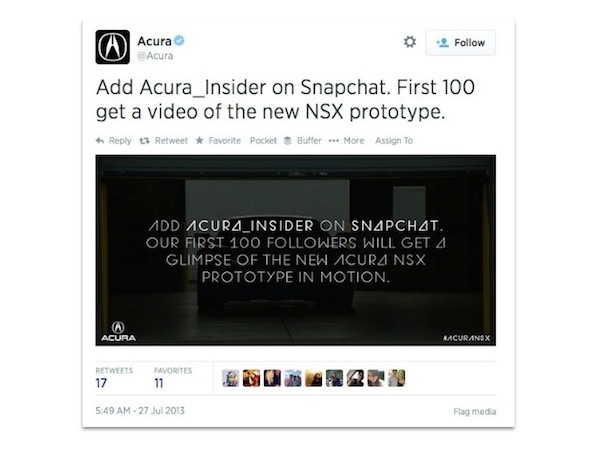 Here’s how Acura approached its Snapchat campaign: “Sharing footage of the NSX prototype on Snapchat created an early round of industry media coverage and inserted Acura into the conversation about brands willing to trying new social platforms. That willingness to move early into uncharted territory earned Acura mentions in Business Insider, Adage, and Digiday,” the team told the Shorty Awards. Taco Bell and Acura NSX entered strong cases for winning the Shorty Awards ‘Best Brand on Snapchat’ category, but both were defeated by youth clothing brand Wet Seal. “We wanted to be thoughtful about how we could exponentially increase our reach, so we partnered with an influencer in the teen space,” Leslie Hall, president at Wet Seal’s digital agency ICED Media, told AdAge. That influencer was Meghan Hughes, a 16-year-old social media star who blogs about beauty and fashion.